Comparison show that the long-term cure rates from all modern prostate cancer therapies is equal . One treatment does not offer any cure advantage over the other. Seed brachytherapy offers equivalent outcomes to that of surgery, including robotic surgery. Multiple international, high-level, evidence-based treatment guidelines attest to this ,,,. We are the most experienced seed treatment centre in Australia and have done nearly a thousand implants since we started in 1998. Figure 1 shows the disease-control for all the men we have treated, including both “low-” and “intermediate-risk” men, are included here. The rate is 90.2% (shown as a proportion 0.902 on the graph). The cancer control for “low-risk” men is better than 92% at 10 years (not shown here). It therefore comes down to what options are suitable for you and what treatment offers the lowest risk of toxicities, important to you. Below are some of the common risks and differences between surgery and brachytherapy. Obviously it is important to discuss all the risks with the appropriate specialist. 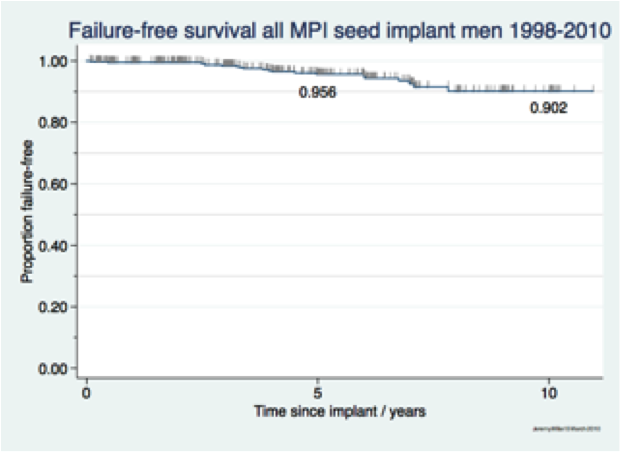 This doesn’t happen after seed brachytherapy: patients usually go home the same day as the implant. After radical prostatectomy in large series the mortality rate has been reported as between one in a hundred or one in two hundred ,. In one study in men 80 or older one in twenty-five was dead with thirty days of the surgery . This is the most common troublesome side effect of seed brachytherapy. Often men will have bladder irritation initially for 1 – 2 months. However this is likely to settle. The vast majority of men have returned to their normal urinary function by one year. Less than 5% will have ongoing, “permanent” urinary problems. Significant problems requiring intervention or a catheter are very rare. No matter how clever the surgeon, or advanced the technology, the stats show that around 5%-10% of men having a radical prostatectomy will have serious incontinence . With seed brachytherapy serious incontinence is a rare event seen in <1% of patients , . It is widely know that radical prostatectomy will practically always cause complete failure to have useful erections. These very uncommonly get back to the prior function, even with the new nerve-sparing procedures. Seed brachytherapy patients usually do not have the problems with their erections. A recent large American study illustrates this . They looked at over a 1000 men treated with either surgery or brachytherapy and were able to derive a very accurate predictive model that allowed estimation of the chances of “functional erections” in men after nerve-sparing surgery, non-nerve-sparing surgery, or seed brachytherapy, depending on their erectile function before hand (Figure 2). Figure 2. Alemozaffar M, et al. 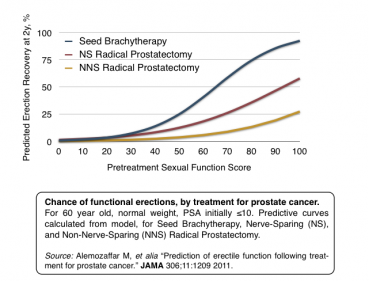 Prediction of Erectile Function following Treatment for Prostate Cancer. 2011 JAMA 306; 11:1209. This showed that if men had “100%” erections prior to treatment, at two years after brachytherapy 92% were OK, whereas after standard surgery this was not much better than 25%. Following surgery, some men notice “penile shrinkage” and this can be a concern to patients and their partners. This is not seen following seed brachytherapy. Men often note a minor change in bowel habit after brachytherapy, but not enough to bother them. Sometimes there is a small amount of bleeding, but this usually settles spontaneously. The risk of bowel damage is very unlikely in the long term. Surgery does not usually cause bowel damage. European Society of Medical Oncology. “Options include active surveillance, radical prostatectomy, external beam radiotherapy, brachytherapy with permanent implants or high dose rate brachytherapy with temporary implants… Ten-year prostate cancer specific survival approaches 100% for each management option”.Horwich A, Parker C, et al Prostate cancer: ESMO Clinical Practice Guidelines for diagnosis, treatment and follow-up. Annals of Oncology 2010. Bubolz T, Wasson JH, Lu-Yao G, et al. Treatments for prostate cancer in older men: 1984–1997. Urology 2001; 58(6):977–82. Stanford et al. Urinary and sexual function after radical prostatectomy for clinically localized prostate cancer: the Prostate Cancer Outcomes Study. Urinary and sexual function after radical prostatectomy for clinically localized prostate cancer: the Prostate Cancer Outcomes Study.JAMA 2000; 283:354. Crook, J., Fleshner, N., Roberts, C., & Pond, G. (2008). Long-Term Urinary Sequelae Following 125Iodine Prostate Brachytherapy. The Journal of Urology, 179(1), 141–146. Peinemann, F., Grouven, U., Bartel, C., Sauerland, S., Borchers, H., Pinkawa, M., Heidenreich, A., et al. (2011). Permanent Interstitial Low-Dose-Rate Brachytherapy for Patients with Localised Prostate Cancer: A Systematic Review of Randomised and Nonrandomised Controlled Clinical Trials. European Urology, 60(5), 881–893. Alemozaffar M, et al. Prediction of Erectile Function following Treatment for Prostate Cancer. 2011 JAMA 306; 11:1209.